The polls in Florida point to a very close contest between Mitt Romney and John McCain. 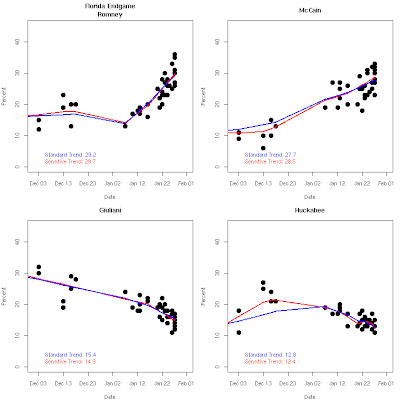 As of Monday's polling used here (there will be new final polls available Tuesday morning) Romney has a small lead based on our trend estimators (both standard and sensitive). But that lead is so small that a "dead heat" is probably still a good characterization of the race. As we've seen in several previous states, the final vote has often broken strongly in favor of the winner with little going to the second place finisher. But who will that winner be? 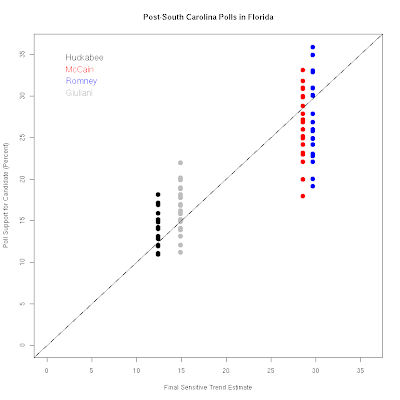 Other than our trend estimates, the data have little more to tell us on that score. With Ron Paul polling consistently at between 4 and 5 points, there are at least 10% of voters yet to make up their minds. A strong surge could boost one of these front-runners from about 30% to near 40% and a very significant win. An even split of undecideds will make for a close finish with both around 33-35%. Both Romney and McCain have been gaining ground in Florida, but Romney's rise has been consistently sharper than McCain's. Moreover, there is little evidence that McCain has enjoyed a post-South Carolina spurt in Florida. Nor does Romney's Nevada win seem to have helped him beyond his already considerable upward trend. As the Florida race narrowed to a two way contest for first place, Giuliani and Huckabee have subsided into the 12-15 percent range. They too could go either way for 3rd and 4th, though at the moment Giuliani has a small advantage for third place. As mentioned above, Ron Paul trails with 4-5% for fifth place. The chart below shows how much the polls in Florida have overlapped since the South Carolina primary and Nevada caucus 10 days ago. While the trend estimates are slightly distinct, the huge overlap of polls for Romney and McCain show that we should remain quite uncertain as to who is "really" ahead. Sometime Tuesday night, we'll find out.